Brown 1 lb of ground meat with onions. 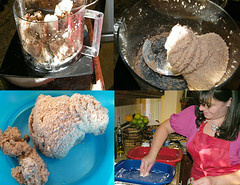 Once the bulgar is ready, add it in bowl with remaining ground uncooked ground sirloin. Add spices. Mix these ingredients very thoroughly (using hands- blender optional) as if kneading dough for a minimum of 15 minutes and must become dough-like. 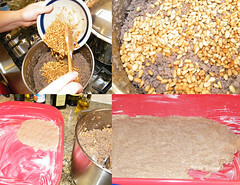 If it is too thick, drizzle some water into mix. Coat bottom of metal 9×13 pan with butter. 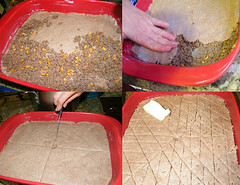 Gradually pat bulgar-meat mix in thin layer on the bottom, spread evenly and pat until smooth. Take cooked meat and onions then mix in pine nuts. Spread evenly over bottom layer. Pat gently into meat layer with spatula or spoon. Dot unsalted butter on top, place in oven, uncovered for 30-40 minutes. Broil for 5-10 minutes towards end to brown top. Cut again before serving. ~ by MyLastBite on March 30, 2009. That you took the time to painstakingly take pictures of the process is a true wonder. This is, in no uncertain terms, an affirmation of the thoughtfulness, complexity, and deep rich flavors of your food. Thank You Phil! For the beautiful comments, I do appreciated! 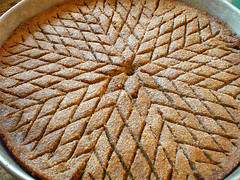 what a beautiful symetrical baked kibbeh, I have tried a similar recipe before but it certainly didn’t look as pretty. I also love the pictures you take of the entire process. Thank you for your great Middle Eastern food. Thanks you, I am going to try it. Uff! This looks so great. Love how you criss crossed it. I’m definitely going to be trying this recipe out. It’s lovely to see our Middle Eastern culture being shared online for others to experience. Thank you so much for the recipe. 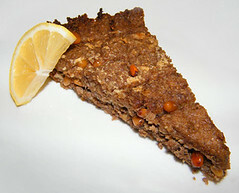 We are having a Syrian Christmas and this recipe is perfect! I am trying your recipe today. After 20+ years of marriage to my wonderful Lebanese husband, he cooked the whole time, I have begun taking over the kitchen and learning to prepare his favorite foods from home. Not easy, since I was the youngest of 4 girls in my Mexican family and never learned to cook, I learned how to clean in a family of 8. Now instead of heading to our favorite Lebanese restaurant, we head to the Lebanese market to stock up. Your recipe was identical to his memory of how his mom made it. Thank you. Wish me luck!! !